Technology, gaming culture and ethical implications | Callie Co.
Gaming as it has evolved as an artform has been heavily restricted by technology and while other artforms have had similar restrictions in the past one of the key aspects of gaming is the interactions, which are tempered by tech restrictions primarily. This has led to jumps in technology to be adopted rather quickly across the industry: when 3D graphics became something that was attainable almost all games jumped to this, when networking became obtainable we saw a rise in multiplayer peer to peer games and when large server farms became affordable we saw the creation of full scale game worlds. In term this defined a new genre of gaming, games as service instead of games as a product. Today I want to look at an event which changed the world of gaming for me personally, that changed the way I interacted with the culture entirely, the creation of MMOs. Games do a lot of things for different players, but one of the primary reasons for play tends to be for escapism: either to escape the patterns of their daily life or to live in a world not bound by social norms (Lazzaro, 2004). In the creation of the first MMO we saw the scope of games increase to levels that became almost... realistic. Players were able to create characters that represented themselves, take part in challenges with other players and even create social groups. This led to a new ethical conundrum that developers had not exactly seen so far, up till this point games as a form of escape was not something that players could do forever; They had to discover new games, engage with new narratives and generally not stagnate in order to find that escape. MMOs changed this game, giving players a place where they could lose years of their life without ever seeing an end. The technology behind MMOs required the developers to spend ongoing money both on development and the cost of the servers to host the virtual world their players inhabited, and thus the idea of subscriptions evolved. Players were essentially paying money to play in an evolving world, which does make sense and does not pose ethical quandaries. However, most MMOs were built around the idea of player satisfaction, and for this there had to be an element of quick rewards for player actions. 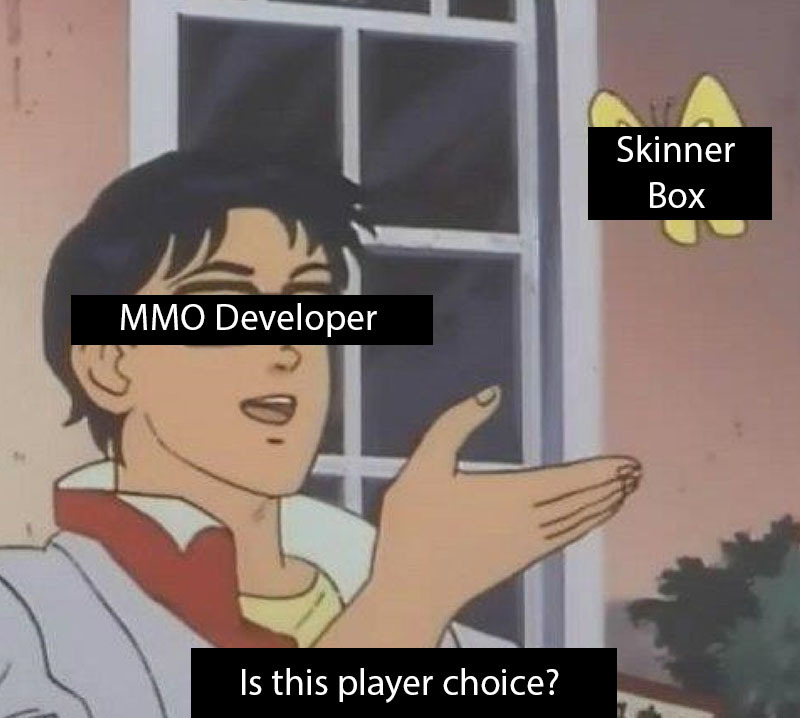 So the developers borrowed from the psychological findings of gamblers, building similar patterns of entrapment that allows the gambling market to stay functional and being described as virtual skinner boxes (Yee, 2002). This led to a new question, do the techniques that gambling machine manufactures use to addict players and cause them to spend money have the same ethical issues when the player is simply spending their time? Mainstream media certainly seemed to think so, with horror stories of Everquest and World of Warcraft being the hot new topic on the prime time news hour. Game developers of this genre are often asked about this, about the people who have sunk years of their life avoiding work duties, avoiding family and social engagements to escape to the virtual world. The majority of answers seem to revolve around the fact that any time spent in game is simply the player's choice, and not something that is forced on the player. In fact World of Warcraft developers have created more addictive techniques, such as rewards for players that log in every day, that will be lost if the player doesn't log in. Still.. it's player choice isn't it?